Visitors to the Charles Darwin University stand at the recent Chamber of Commerce NT Central Australian Expo were spoilt for choice—with food tasting, hairdressing and health checks offered by staff and students over the two day event. 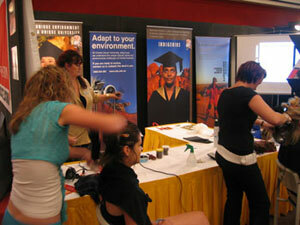 It was the biggest year to date for the business Expo, which is held annually at the Alice Springs Convention Centre. This year’s event attracted 8,000 visitors including Alice Springs locals, interstate and international tourists. CDU staff were on hand to provide course information and promote the upcoming Desert Lantern training restaurant dining dates. Passers-by were also able to experience some of CDU’s courses first hand. Hospitality lecturers Nick DeSilva and Hayley Tobin drew a crowd whipping up tasty delights including beef stroganoff and Pernod prawns. Hairdressing lecturer Denise Corey and her team of VETiS students gave a new look to some willing models. Nursing co-ordinator Perrin Whimpress and his students were kept busy taking blood pressure and administering glucose checks. The expo will celebrate its 20th anniversary next year.